Grouchy, greedy and constipated: nobody could accuse Stephen Frears of kowtowing with his portrayal of Queen Victoria in his new film Victoria & Abdul, which premiered in Venice on Sunday. The director, who won a string of awards for The Queen, his 2006 depiction of Queen Elizabeth II in turmoil at the time of Princess Diana's death, returns to royal questions in a tale of the current British monarch's great, great grandmother's friendship with a young Indian Muslim, Abdul Karim, in the final years of her long reign. Set at a time when the British Empire was at its peak and India was its "Jewel in the Crown", Frears' script lampoons the pomposity, arrogance and ignorance of the Imperial age. But, he says, the convention-defying, cross-cultural relationship at its heart has resonance today, when Britain and India's relationship has been transformed but racism and Islamophobia linger. "It was always meant to be funny," Frears said. "I thought, 'What film would Donald Trump most like to see?'." Abdul, played by Ali Fazal, is a Indian Muslim prison clerk picked out, on the strength of his height and Victoria's liking for tall men, to be sent to London in 1887 to present the queen with a gold Mughal coin as part of celebrations to mark her golden jubilee. It is supposed to be a fleeting visit on which, he is repeatedly told, he must above all avoid looking directly at his Empress, played by Judi Dench 20 years after her first turn as Victoria in "Mrs Brown". It is an instruction Abdul flouts and having caught the sovereign's eye he is soon ensconced in the royal household, to the fury of her son Bertie, the future Edward VII, and a toadying clutch of buttoned-up courtiers and ladies-in-waiting who surround and stifle the monarch. Indian actor Fazal said he had delved into history books to get a grasp of Abdul's unique experience. "That time was so different and so essential to this fantastical little world that these two created at the middle of this massive British Empire," he said. "The important thing was that we more or less humanised that era where there was protocol, there was racism and everything that we are still dealing with now." The Victoria Abdul first encounters is frail and unhappy, a morbidly obese compulsive eater who is incapable of getting through her wolfed-down meals without smearing food across her face. "I'm so lonely, everyone I've really loved has died and I just go on and on," she tells her new confidant, 30 years after the death of her husband Albert and four years after her later-life companion, Scottish gamekeeper John Brown, passed away. Soon though she has recovered a glint in her eye as Abdul's presence gives her a new lease of life. Dench said the offer to play Victoria again had been an "irresistible proposition". "It is very, very complex her attitude to Abdul: not just a feeling of love, but the delight of being relaxed with someone without anyone around or any standing on ceremony." Victoria and Abdul's bond strengthens as he teaches her Urdu and introduces her to the Koran and Indian poetry. By this time the scandalised royal household is in open revolt, with the irascible Bertie (Eddie Izzard), playing chief mutineer, even threatening to have his mother certified insane. Victoria stands her ground but with his protector ailing, it is clear Abdul's return to India is only a matter of time. Abdul's story, and the remarkable fact that Victoria, who initially knew so little of India she had to ask him to describe a mango, learned sufficient Urdu to write letters in it, went untold for over a century, largely because of the efforts Bertie went to to destroy all evidence of it. Traces survived however and some historical detective work by journalist Shrabani Basu brought the story back to life. 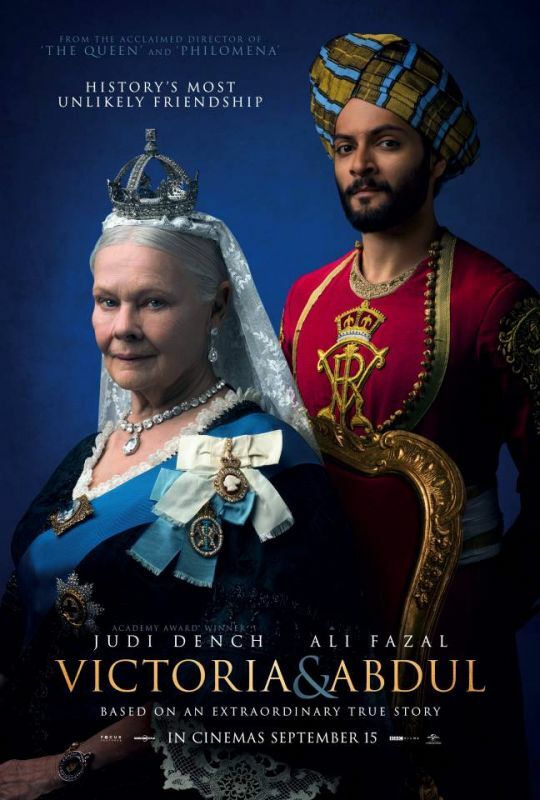 Her book, "Victoria & Abdul: The True Story of the Queen's Closest Confidant," was written after she discovered 13 of Victoria's journals which, because they had been written in the Urdu Abdul had taught her, had been overlooked by British historians. She then tracked down, via a nephew of Karim's in Karachi, a diary that he had kept as well as some surviving correspondence between the two that had lain forgotten in the vaults of the Royal Archives. The letters confirmed the degree of intimacy between the young man and the dying monarch. Invariably sprinkled liberally with kisses, Victoria describes her protege in one as a "true friend." Frears' film was shown outside of competition at the Venice festival where the director was due to receive a lifetime achievement award at a gala ceremony later Sunday.